In 1974, the futurist/science fiction writer Arthur C. Clarke described for Jonathan, a little boy about five years old, what his life will look like in 2001. And boy did he get it right. Of course, these thoughts weren't particularly new for Clarke. A decade earlier, in 1964, he predicted pretty much the same thing. In a world of accelerating obsolescence, of plastic products and digital information, a few old-school craftsman are still hanging on. But they're getting harder and harder to find. In this pair of short films we meet a few craftsmen on both sides of the Atlantic who are stubbornly persisting while the world changes around them. Above is Ink & Paper by Ben Proudfoot, a student at the University of Southern California School of Cinematic Arts. It tells the story of the men who run the last surviving letterpress printing company in downtown Los Angeles, and the oldest paper company. Below is Le Mer de Pianos (The Sea of Pianos) by Tom Wrigglesworth and Mathieu Cuvelier, about the man who has spent 28 years (the last 15 as owner) running the oldest piano repair shop in Paris. The films listed above, and many other classics, appear in our collection, 1,150 Free Movies Online: Great Classics, Indies, Noir, Westerns, etc.. The great bluegrass banjo player Earl Scruggs died Wednesday at the age of 88. Shortly afterward, Steve Martin sent out a tweet calling Scruggs the most important banjo player who ever lived. "Few players have changed the way we hear an instrument the way Earl has," wrote Martin earlier this year in The New Yorker, "putting him in a category with Miles Davis, Louis Armstrong, Chet Atkins, and Jimi Hendrix." Some nights he had the stars of North Carolina shooting from his fingertips. Before him, no one had ever played the banjo like he did. After him, everyone played the banjo like he did, or at least tried. In 1945, when he first stood on the stage at the Ryman Auditorium in Nashville and played banjo the way no one had heard before, the audience responded with shouts, whoops, and ovations. He performed tunes he wrote as well as songs they knew, with clarity and speed like no one could imagine, except him. When the singer came to the end of a phrase, he filled the theatre with sparkling runs of notes that became a signature for all bluegrass music since. He wore a suit and a Stetson hat, and when he played he smiled at the audience like what he was doing was effortless. There aren't many earthquakes in Tennessee, but that night there was. You can continue reading the essay at The New Yorker Website. In November of 2001 Martin had the opportunity to play the banjo alongside his hero on the David Letterman show. (See above.) They played Scruggs's classic, "Foggy Mountain Breakdown," with Scruggs's sons Randy on acoustic guitar and Gary on Harmonica, and a stellar group that included Vince Gill and Albert lee on electric guitar, Marty Stewart on mandolin, Glen Duncan on fiddle, Jerry Douglas on Dobro, Glenn Wolf on bass, Harry Stinson on drums, Leon Russell on organ and Paul Shaffer on piano. 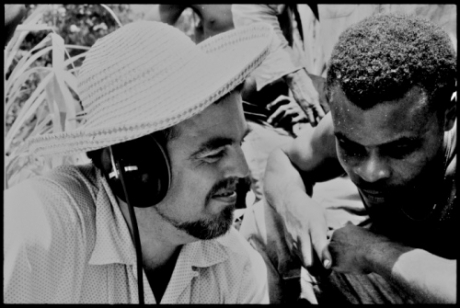 A huge treasure trove of songs and interviews recorded by the legendary folklorist Alan Lomax from the 1940s into the 1990s have been digitized and made available online for free listening. The Association for Cultural Equity, a nonprofit organization founded by Lomax in the 1980s, has posted some 17,000 recordings. "For the first time," Cultural Equity Executive Director Don Fleming told NPR's Joel Rose this week, "everything that we've digitized of Alan's field recording trips are online, on our Web site. It's every take, all the way through. False takes, interviews, music." "John Henry" sung by prisoners at the Mississippi State Penitentiary, Parchman Farm, in 1947. "Come Up Horsey," a children's lullaby sung in 1948 by Vera Hall, whose mother was a slave. "In a Shanty in Old Shanty Town" performed by Big Bill Broonzy, 1952. "Story of a slave who asked the devil to take his master," told by Bessie Jones in 1961. But that's just scratching the surface of what's inside the enormous archive. Lomax's work extended far beyond the Deep South, into other areas and cultures of America, the Caribbean, Europe and Asia. "He believed that all cultures should be looked at on an even playing field," his daughter Anna Lomax Wood told NPR. "Not that they're all alike. But they should be given the same dignity, or they had the same dignity and worth as any other." You can listen to Rose's piece about the archive on the NPR website, as well as a 1990 interview with Lomax by Terry Gross of Fresh Air, which includes sample recordings from Woody Guthrie, Jelly Roll Morton, Lead Belly and Mississippi Fred McDowell. To dive into the Lomax audio archive, you can search the vast collection by artist, date, genre, country and other categories, or go to the Sound Collections Guide for easy browsing. Depending on which circles you run in, you might have first spotted singer-songwriter-actor Glen Hansard as the leader of the rock band The Frames, as an actor in Alan Parker's film The Commitments, or, more recently, as one half of the folk-rock duo The Swell Season. But if the success of John Carney's movie Once is anything to go by, you may well have become aware of Glen Hansard while watching it. Carney, The Frames' former bassist, knew that Hansard had accumulated just the kind stories in his youth spent busking around Dublin to shape his film's down-and-out musician protagonist. By shooting time, Hansard had taken on the role himself, ensuring that a whole new, large audience would soon learn of a second inimitable Irish voice to put on their playlists. The first, of course, would have to be Van Morrison, whose artistic captivation of generations of listeners extends to Hansard himself. Invited to Morrison's birthday party by a Guinness heiress whom he befriended while busking, Hansard seized the chance to get near his favorite singer. Like some brave fans, he found a way to approach the reputedly brusque and temperamental Morrison. Unlike most of those fans, Hansard's experience turned into a uniquely close and personal one. Watch the clip from Kevin Pollak's Chat Show below and hear him tell the story of how he inadvertently parlayed a brushed-off song request ("You don't know me!" was Morrison's devastating dismissal) into an entire night spent exchanging songs alone with his musical idol.